One of my favorite summer activities is fishing. The refreshing sea air. The sun glistening off the water. The struggle with a catch and anticipation to see its size. Fresh sashimi for lunch. A grilled fish dinner that night. 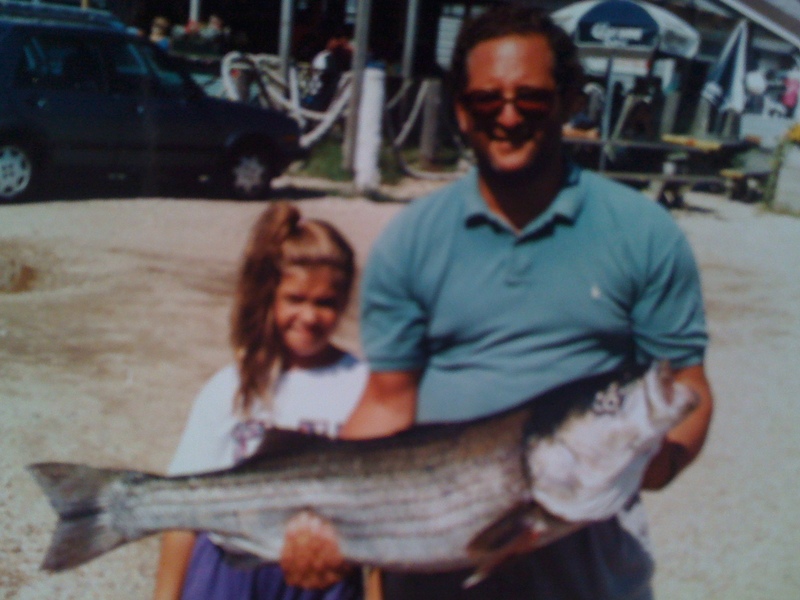 One of my great memories is when my daughter caught her first fish, which we stuffed and put on the wall (in my parent’s house!) (see Fat Eddie and said daughter pictured here). Every summer I charter a boat out of Montauk for an off-shore or deep sea day trip with a small group of friends or family. This idea always generates a lot of enthusiasm among first time guests, sounding to the uninitiated like the quintessential summer fun. Then the reality of awaking at 4:30am followed by the bracing smell of diesel fuel and rotting fish guts upon arrival at the dock begins to set the landlubbers apart from the real fishermen. Within minutes of shipping off, the combination of precautionary seasickness pills and the early morning wake-up call begins to take its toll, knocking out the first members of the team. Usually the youngest are first to go, with teens and twenty-somethings particularly vulnerable from having their minimum 12 hours of beauty rest interrupted mid-REM. After about 45 minutes out at sea, the impact of the boat rolling with the swells starts to turn some faces green. But there’s no turning back. Unfortunately, not all fishing trips result in catching any fish. There are a few of my friends that are uniquely unsuccessful at catching anything. One calls himself “The Unlucky Fisherman”. He travels all over the world to exotic destinations where he doesn’t catch anything. After every fishing excursion, he comes back to shore a bloody mess. He loves playing with the scaling knife, spending most of the trip cutting bait, line and himself. After forty years of coming home empty-handed, one might think he would begin to question whether luck had anything to do with his lack of success and simply switch to “The Bloody Bait Cutter”. Another equally “unlucky” friend, who I shall call “The Commodore”, doesn’t like to get messy. His specialty is buying great fishing accessories (he also has great cars, golf clubs and probably several beautiful unused bowling balls, bags and shoes stashed in his closet). One time he invited me out on his boat, which was in remarkably pristeen condition for a fishing vessel. When I arrived, bag of donuts in hand and dressed in a baggy T-shirt, ripped shorts and bloodstained docksiders, he stood on board looking like a model from Field & Stream in full khaki regalia, floppy broad-brimmed hat, matching cargo shorts and a vest with a zillion pockets filled with hooks, lures, lines, knives, and gloves. He promptly gave me a tour of his boat, proudly showing off his foolproof sonar-equipped fish finder and assuring me we could not fail to reel in a great haul. My first inkling of what to expect came when all of the marina employees came out to help nervously guide The Commodore as he maneuvered his boat out of it’s slip. We then spent several hours racing impatiently from barren fishing spot to barren fishing spot, eventually returning in our still pristeen vessel with nothing but half a bag of soggy donuts. This entry was posted in Ruminations, Sports, Travel and tagged Boating, Children, Fishing, Friendship, Hamptons, Humor, Musings, Sports, Travel. Bookmark the permalink. An adventure NEVER forgotten by your nieces and nephew, hence their hatred for the open seas! Jared beat me to writing the same comment!